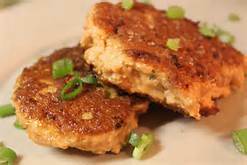 Salmon patties are not only rich and satisfying, they are also inexpensive when using canned salmon, and a great source of protein, Omega-3 and calcium. In addition, they make an ideal pantry meal when you haven’t had time to grocery shop or plan dinner. One protein serving is one patties. Place salmon in a bowl, breaking up with a fork. Remove skin and larger bones, if desired, but it’s safe to leave them in. They are a great source of calcium. Add remaining ingredients, except oil, and gently mix until combined. Form into four patties with your hands and place on a flat plate. Refrigerate, covered, for at least 30 minutes or overnight to set.